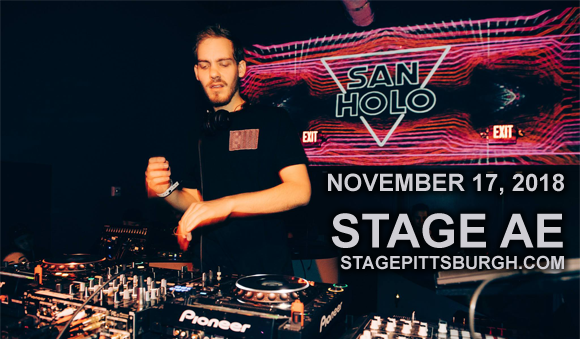 San Holo brings his unmistakable future bass sound to Stage AE on Saturday 17th November 2018! The Dutch producer and DJ sensation is touring in promotion of his upcoming debut album titled, appropriately, album1, including recent singles "worthy" and "lift me from the ground"! Rest assured this up-and-coming star will have the dancefloor swarming with his trap-influenced EDM beats! Catching the ear of the trap music scene in 2014 with his 2014 remix of Dr Dre's “The Next Episode,” which has since had over 140 million views on YouTube, Dutch DJ, composer, musician and record producer San Holo career is moving from strength to strength. Signed to Heroic Records in 2013, San Holo has since released music on several record labels including Spinnin' Records, OWSLA, Barong Family, and Monstercat, as well as founding the label bitbird in 2016, which has released several of his singles including "Still Looking" and "Light." In August 2018 he released two singles from an upcoming album on bitbird titled album1 (release date currently unknown) – "worthy" and “lift me from the ground”.